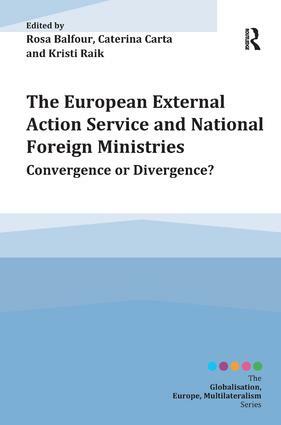 Based on extensive empirical work by a cross-European group of researchers, this book assesses the impact of the creation of the European External Action Service (EEAS) on the national foreign policy-making processes and institutions of the EU member states. As such, the contributions cover both the involvement of the national diplomatic and foreign policy actors in shaping the outlook of the EEAS and its mission, as well as the changes (or not) it has produced for those actors of the member states. The analysis draws in theoretical frameworks from Europeanization and socialization, but also from intergovernmental frameworks of policy-making within the European Union. An introduction by the editors outlines the issues and trends examined in the book and establishes the theoretical and methodological framework. Split into 2 sections, Part I: EEAS and national diplomacies as part of global and European structures has contributions by Richard Whitman, Rosa Balfour, Christian Lequesne, Caterina Carta and Simon Duke. Part II: National diplomacies shaping and being shaped by the EEAS is covered by Daniel Fiott, Fabien Terpan, Cornelius Adebahr, Andrea Frontini, Ignacio Molina and Alicia Sorroza, Laura C. Ferreira-Pereira, Alena Vysotskaya G. Vieira and Louise van Schaik, Grzegorz Gromadzki, Mark Rhinard, Jakob Lewander and Sara Norrevik, Sabina Kajnc Lange, Ruby Gropas and George Tzogopoulos, Vit Beneš and Kristi Raik. This book is much needed, especially in an era when the EU is trying to pull its weight in the international sphere (e.g. Syria, Iran, the Arab Spring, Chinese relations and emerging powers) but also at a time when the EU is trying to recalibrate its institutional structure in light of the current financial predicaments and questions on the democratic legitimacy of the European project. "This is a wide-ranging and stimulating review of the European External Action Service and of the impact it is having on the national diplomacies of EU Member States. A robust framework based on ideas of Europeanisation and adaptation and a series of sharply focused essays by experts make this essential reading for researchers and teachers in this area." "Provides us with a fine-grained family picture� of European diplomacy at a crucial moment in time when the EEAS and national diplomatic networks are aiming for a new balance after rocky early beginnings. An excellent source of important information for anybody interested in European foreign policy." "The EEAS and National Foreign Ministries is an important contribution to an under-studied topic. The methodology applied in order to look at the positions of the Member States (semi-structured elite interviews and process-tracing) permits to develop a compelling argument and confirms the expectations of European experts. … a complete work and very accessible despite the complexity of foreign-policy making in the EU." 9. Portugal and the Netherlands: Punching Above Their Weight? 12. The Czech Republic, Estonia and Finland: European Vocation Re-Confirmed? Conclusions: Adaptation to the EU or to the Changing Global Context? Rosa Balfour is Head of the Europe in the World Programme at the European Policy Centre (EPC) in Brussels. Prior to joining the EPC in 2007, she was a Senior Research Fellow at the Centre for Studies in International Politics (CeSPI) in Rome. She holds an MA in History from Cambridge University, and an MSc in European Studies and a PhD in International Relations, both from the London School of Economics and Political Science. Caterina Carta, is lecturer at Vesalius College and associate researcher at the Institute of European Studies (IES) at the ULB. She holds a PhD in Comparative and European Politics from the University of Siena. Kristi Raik is Senior Research Fellow at the Finnish Institute of International Affairs (FIIA) and Adjunct Professor at the University of Turku. Prior to joining FIIA in 2011, she served inter alia as an official at the Directorate-General for External and Politico-Military Affairs in the General Secretariat of the Council of the European Union and as a Visiting Fellow at the Centre for European Policy Studies. She holds both a Masters and a PhD in Social Sciences from the University of Turku.